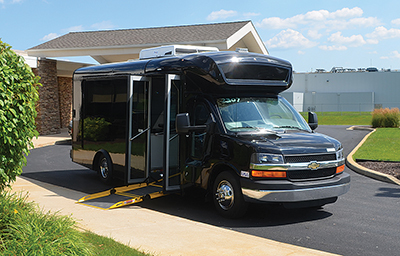 Home»Channels»Paratransit»Safety and Accessbility: Are we there yet? It is bitterly cold outside today as I sit next to the tall, icy streetlamp and wait. The wind blowing snow in a horizontal blur silences the passing vehicles throwing slush onto the sidewalk in front of me. I want nothing more than to warm up inside of that bus, but when I finally see it round the street corner under the rim of my fur-lined hood, I realize I am not prepared for this. Unfortunately, I cannot afford to miss another appointment and the bus is already parked here in front me, so I reluctantly grab my walker and commence my trek toward the rear of the vehicle, snow crunching underfoot. The driver steps out and slowly makes his way around the bus toward me. He should be in a hurry with this extreme weather, but apparently the cold doesn’t affect him quite like it does me. After what seems like an eternity, he opens the door and begins lowering the dreaded lift that moves no faster than a snail’s pace! As I wait yet again, I begin to daydream of a time when I was young and able – a time when I didn’t have to spend my days waiting for a bus and when my lips didn’t turn blue while heading to get my blood pressure checked for the hundredth time. With all this stress over something simple like transportation to an appointment, it is no wonder why my blood pressure is high! Eventually the lift clangs against the ground with a thud and I am awoken from my bittersweet daydream to face this awful reality. Now let me just say that I have never been afraid of heights, but when you are standing on a platform that is lifted into the air, trying to both steady your walker as it is jostled around and hold on so you don’t fall off, all while a bus full of passengers sit and stare – it is a terrifying experience. Everyone is watching and waiting, so I gain composure and carefully step onto the lift. Once I am situated, it begins to rise off the ground at its ever-so-consistent snail’s pace. While the nation is so passionately dedicated to increasing equality, the transit industry seems to lag. Passengers with disabilities tend to be singled out and forced into the spotlight. 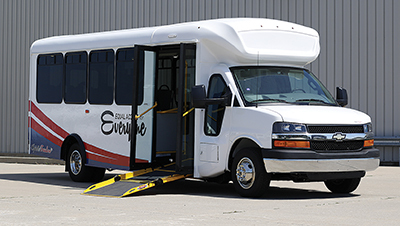 With an increasing number of buses sold in the United States and Canada each year, accessibility and safety must be established priorities as public transportation progresses. Each passenger, regardless of their abilities or disabilities, should experience transportation services in the same manner as the next with the absence of fear, improving the rider experience for everyone. Regarding accessibility, the solution seems obvious – low-floor buses featuring a bi-fold entrance ramp. By utilizing this configuration, the boarding process is simple. Everyone enters using the same doorway with little (or no) assistance, allowing mobility-challenged passengers to blend harmoniously with the other riders. Though this is certainly favorable to commuters travelling in wheelchairs, they are not the only people who benefit from the use of a ramp. Young children, travelers toting luggage, senior citizens who make up an increasing number of the passenger share, and even the average healthy male or female sometimes have a hard time with multiple steps. Because a ramp can be deployed from the driver’s seat in only 10 seconds and stowed in another short 10 seconds, time is cut down tremendously in comparison to a high-floor bus which takes up to five minutes to load or unload a single passenger using a mobility device. This creates a massive decrease in route times and delivers all passengers to their destinations quicker than ever before, making the list of people who can benefit from an entry ramp endless. While low-floor buses with a ramp are a great factor in transportation accessibility, there are concerns that lie much deeper than simply entering and exiting the bus. The accessibility landscape encompasses the entire beginning-to-end riding experience. This includes navigating to your seat, utilizing all the features of the bus while in route, and traversing back through the bus after leaving your seat when you have arrived at your stop. The cabin design should support easy maneuverability for passengers of all types. Again, steps are difficult for many people to use so a single-plane floor is ideal, and safer, in most situations. Custom grab handles and rails should be designed and integrated to accommodate passengers in wheelchair positions in addition to mounting stop buttons in easy-to-reach locations. Large lettering in contrasting colors and/or braille on signs and other areas of the vehicle should be incorporated for the visually impaired. Implementing minor details such as these has a significant impact on many passengers’ experience, which helps to create a sense of equality within public transportation. Safety is a significant element in many trades, but is exceptionally commanding in the transit industry. Passengers should ride stress-free knowing the producer of the bus they are commuting in did everything they could to ensure a safe trip. While everyone wants their product to be safe, very few utilize the many precautions that are available at their disposal. In a technology-driven world, there are more opportunities than you can imagine, such as surveillance options, head’s up displays, and various other driver alerts that serve as an extra set of eyes and ears for the driver. As a result, the pressure of keeping a group of people safe does not fall solely on the shoulders of the driver. GPS fleet tracking systems can improve bus security and safety in multiple ways. If a bus goes off its scheduled route or is missing for any number of reasons, the GPS system knows and the company can quickly locate it. These systems can also track driver behavior, such as speeding, idling time, and unauthorized vehicle use which encourages drivers to act more responsibly. While preventative actions are necessary, other measures must be taken to ensure passengers are protected if accidents or system malfunctions do occur. 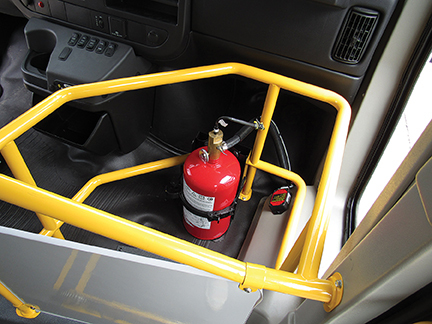 For example, engine compartments in buses have potential hotbeds and if they catch fire, it is often fast and difficult to suppress with only a handheld fire extinguisher; however, an assortment of fire suppression systems are available and can typically be installed in less than a day. 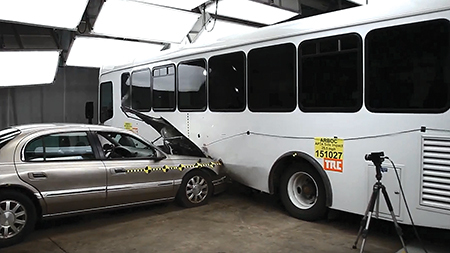 Looking at a different angle, each bus manufacturer completes mandatory testing that was set in place to protect passengers, but what do the manufacturers do in addition to what is required? 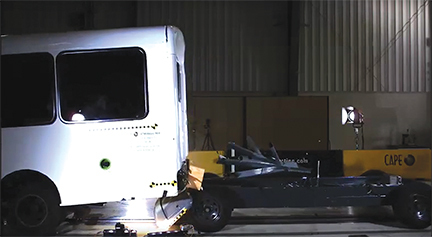 Unfortunately, very few companies in this market go above and beyond when it comes to safety testing. Many manufacturers may argue that the supplementary testing is too expensive; however, with lives at stake, ARBOC sees the extra effort as a no-brainer. In the past five years, or even in the past decade, there has been more of a focus on the best interests of passengers, but ideas seem to corrode away before any action is taken. Each of us plays a role in shaping the future of mobility. Allowing our parents, grandparents, children and friends to use public transportation with a sense of safety and belonging rather than the presence of unwanted attention should be a priority for everyone involved in the transportation community. Whether or not societal equality can be achieved is debatable, but if we start with what we can control, i.e. public transportation, we can certainly aid in bridging the gap towards a brighter future. Ami Sailor serves as marketing manager for ARBOC Specialty Vehicles.